The weekend before the judges (Heidi Klum, Howard Stern, Howie Mandel, Melanie Brown, a.k.a Mel B.) 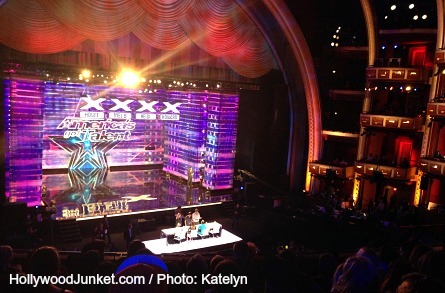 of “America’s Got Talent” (AGT) arrived to The Dolby Theater in Hollywood, Ca, the show held a special sneak-peek session for die-hard fans of the show called “America’s Got Talent Behind the Scenes” which was at 8:30 am on a Saturday! We’re talking DIE-HARD fans! During this preview, fans got to sit among the contestants who had already auditioned in front of the show’s producers, but were now invited back for an intimate filmed interview with show producers. These are the interviews that are played just before their audition in a similar fashion as “American Idol”, and “The Voice”. HART DANCE – they dance with a box! 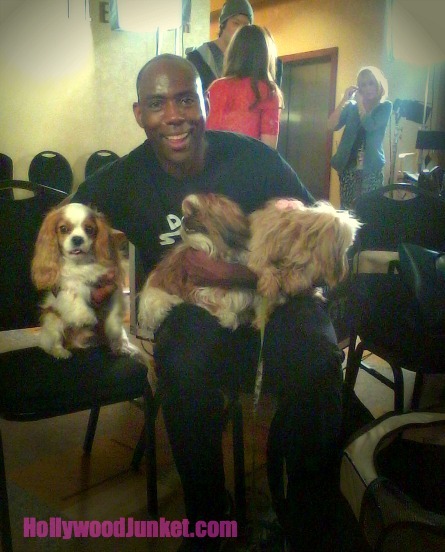 MAX, or MAXINE – singing is “indescribable”. DARIN “Dangerous D” MALFI – self-mutilation act. JUDGES ARRIVE – WALK OF FAME RED CARPET! Monday, April 21st, the judges arrived to The Dolby Theater to a red carpet on The Hollywood Walk of Fame. Fans and members of the media alike welcomed them by taking photos and videos. AGT producers said that the judges arrived for the red carpet two hours before show time. Pictured: Heidi Klum arrives to the Dolby Theatre on Hollywood Walk of Fame. Pictured: AGT judge Heidi Klum poses with a fan in front of the Dolby Theatre. 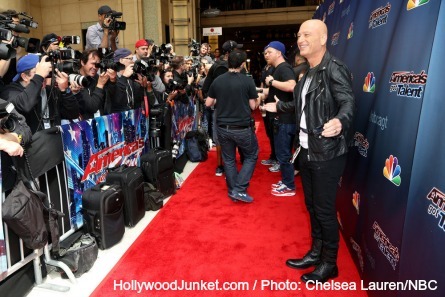 Pictured: AGT judge Howie Mandel on the red carpet at the Dolby Theatre. Making the annual rounds from city-to-city all across America to audition people from all walks of life, the stop in Los Angeles, was said by the show’s audience warm-up host, Frank Nicotero to have the highest number of talented contestants who managed to make their way past the three “X”s and on to the next round which is boot camp. Some of the other cities that AGT stopped-by in search of out standing talent for this 2014 season were: Nashville; Greensboro; Baltimore; and Providence. AGT- Inside the Dolby Theatre! “America’s Got Talent” filmed the Los Angeles auditions in front of the judges for one week from Monday, April 21st to Friday, April 26th. During Hollywood Junket’s visit to one of the tape days, we were ushered into the theater promptly, and the judges were entering the theater not later than about forty-five minutes after that. The host of the show, Nick Cannon, called them out one-by-one. Howie was the first to arrive, wearing a silver jacket, followed by Mel B who was looking very hip and trendy in a form-fitting leopard-printed mini dress and white chunky, strappy heels. Next, Heidi showed-up in a classic baby-blue suit. Then Howard Stern, called “the prettiest” judge by Cannon, arrived in a predictable grey shirt with a black jacket and black pants. Some memorable acts included a real life spider man, and a bird man. Most of the acts performing that day consisted of groups of very young children – ages eleven to about sixteen that were either dancers or singers. The bird man fell victim to a bird with a frog in it’s throat. The spider man act caused Howard and Mel B. to get out of their seats to run for cover, while all Heidi wanted to do was play with both the spider and the bird. One of the youthful acts brought about a split vote. Two of the judges voted “yes” and two voted “no”. When this occurs, the act either gets sent home, or a judge can hit the “Golden Buzzer” which keeps the act in the competition. The only catch – each judge is allowed to hit the button only once during an entire season. “Britain’s Got Talent” was the first to add the new feature to the game during their current season airing now, and the buzzer has now been introduced to the American version. Mandel stated in an NBC press conference that he had already used his turn. Another judge that also hit it is Howard Stern. But, he could not resist in hitting the button again. Viewers will be highly entertained this season to see how Howard and the show’s producers resolved this conundrum! 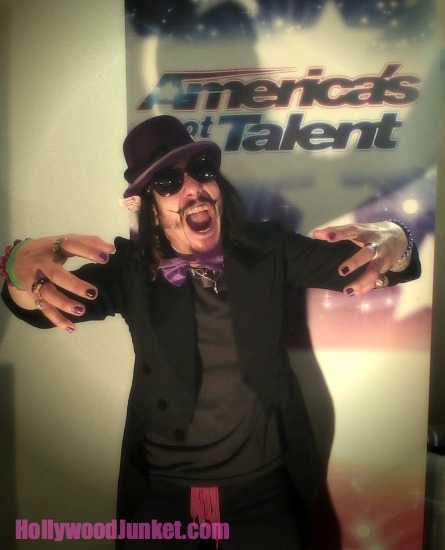 “America’s Got Talent” season 9 premieres Tuesday, May 27, 2014 on NBC.